Guess what folks, if you are not as lucky as Claire or my mum, you too can now get your own Colin from Sainsbury's. Yes, Sainsbury's. They're starting to sell pieces of ME and at a very affordable price too. Pollack, once deemed fit only for the cat, is being given a new name by the supermarket chain Sainsbury's after research showed that many customers were embarrassed to ask for it. Consumers are to be urged to try "colin and chips" on Fridays in preference to their usual haddock and chips. 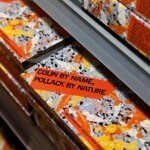 The new name (pronounced co-lan) is French for pollack when cooked, and reflects France's love affair with the British product. Colin is NOT French for pollack, it's French for hake. Pollack already has a name, why give it another? Colin is pronounced 'col-lin', not 'co-lan'. Only this American chap should be allowed to mispronounce his own name. REAL Colin is far too expensive for Sainsbury's to sell. I like to think REAL Colin is very rare and would only be sold by the finest of boutique deli's (which don't exist yet). It'll also be priced like platinum - very expensive, and by the ounce. So if you're feeling hungry, and want to help the dwindling cod supplies, head on over to Sainsbury's and pick up a box of frozen me pieces or me fingers and have them with chips and All Gold Tomato Sauce - the best tomato sauce in the world.